(VEN) - Bac Ninh province’s people's committee recently approved a 60 billion dong project on protecting and promoting cultural heritage values of Dong Ho folk paintings in Thuan Thanh District in the 2014-2020 period with an orientation until 2030. This is considered a major move aimed at preserving and developing the cultural value of this precious type of painting. At Dong Ho Painting Restoration and Preservation Center, artisan Nguyen Dang Che said the making of Dong Ho folk paintings dates back to the 16th century and has existed for over 500 years. This type of painting flourished before 1944 when the Dong Ho Village had two major occupations: making folk paintings to sell during Tet holidays and making votive papers and products. Before the August Revolution, 17 family lines in the village were engaged in making paintings. Normally, from January to mid-July of the lunar calendar, the whole village focused on making votive papers and from August to the year’s end they moved to make Dong Ho folk paintings for sale on Tet holidays. However, due to a change in taste, especially the impact of the market economy and the emergence of a wide range of modern paintings, the craft in Dong Ho painting village has largely died out. The village currently has just two households led by old artisans while the remaining villagers have already switched to making votive papers and other products to earn their livings. At present, Dong Ho folk paintings are mainly sold to tourists, but for the last two years, the number of tourists coming to the village has declined to just a few dozen. Nevertheless, each year thousands of pupils and students across the country come to Dong Ho to watch the paintings and serve their apprenticeship as drawers. This has made the painting makers love their job more and feel the need to preserve the craft. With determination not to lose the local cultural heritage, artisan Nguyen Dang Che and his children have bravely invested more than VND3 billion to build the Dong Ho Painting Restoration and Preservation Center on an area of 5,500 square meters. With investment and involvement of functional agencies and the passion for the local craft, hopefully in the near future, Dong Ho painting village will return to its old bustling days. Director of Bac Ninh Department of Culture Sport and Tourism, this project will be implemented from 2014 to 2016. Specific works include restoring and developing Dong Ho folk paintings (2014-2016), building a Dong Ho Painting Preservation and Value Promotion Center (2014-2020) and putting Dong Ho folk paintings to the list of intangible cultural heritages which need urgent protection and submit it to the UNESCO (2014-2016). 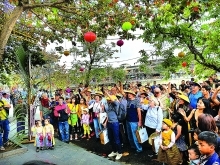 Apart from this project, Bac Ninh Province is also encouraging Enterprises to boost tourism in Thuan Thanh and promote advertisement of Dong Ho folk paintings into schools and to the international market./.